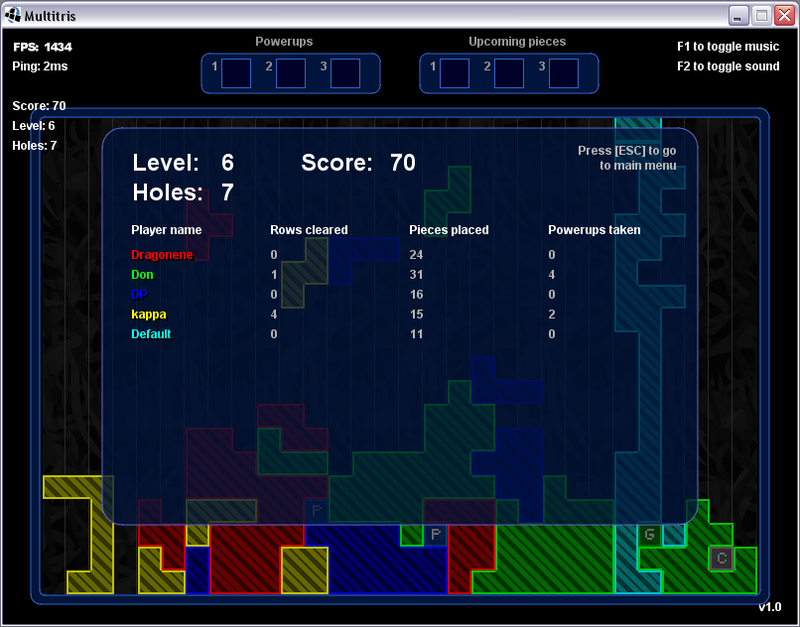 Me, Laundon and three others (dicander, bozis, bartac) have been working for a while on a cooperative multiplayer version of Tetris. You're welcome to try the single-player mode, but it's in multiplayer it really comes to life, so I recommend you find somebody to play with! The game has a central server running that keeps track of all the game servers currently running - let me know if there's any trouble with it, please! Instructions are available in-game, and there's also some stuff in the multitris help (not up to date). LWJGL and Slick are both used. 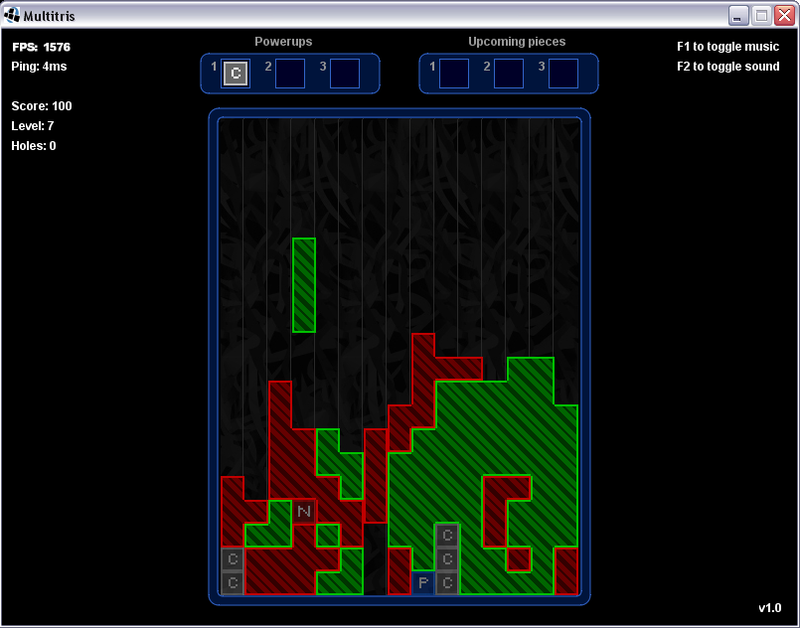 The first two screens below are from a two-player game. 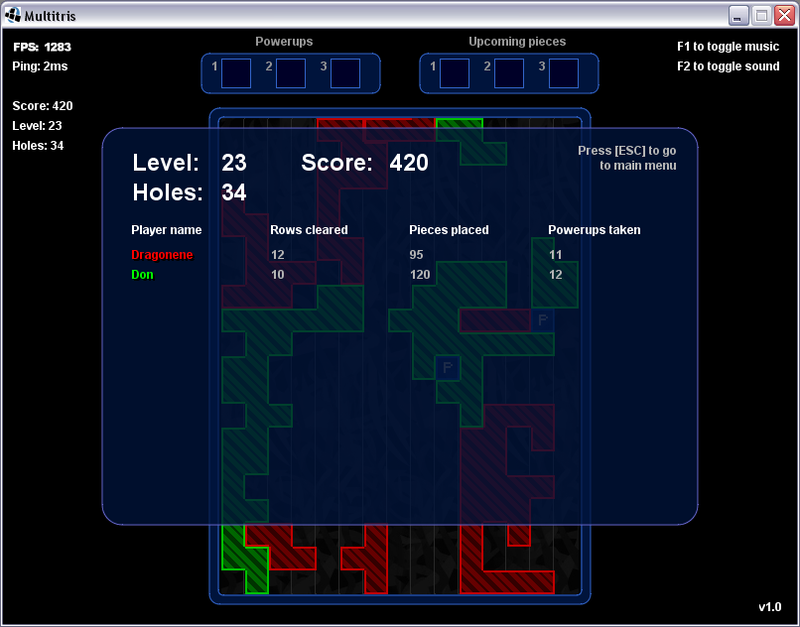 The third screen is shows the score screen for a five player game. If enough players play at once, the board will scroll along with your piece. As always, any input, comments and critique are warmly welcome! I think this is a great idea, but no servers! How about some AI players? It seems interesting. I will add it into the Java(tm) Game Tome. Good job! Now it works under Mandriva Linux 2007!!!!!!!! Yeah! Thank you! Fix for OSX sound problem upcoming soon, I think we've solved it but it's not updated yet. Ok, when it is fixed, I will add it into the tome but it is very important that your game works under Linux, Macintosh and Windows at least (under Unix, it would be even better ). Fix uploaded, and reports so far say sound works fine on OSX too. Updated - now has the new website instead of the webstart link. The website shows all currently running games, and they can be joined directly via an auto-generated JNLP by clicking the server's name. Also a few changes to the game. Looking forward to getting a working version. Huh, that's odd. An exception with no additional information, and it works perfectly for some on XP, OSX, Ubuntu. I have, though, seen that error twice now, once on XP, once on OSX - doesn't make any sense to me. Will try to figure it out, sorry! Yeah, it's weird. Thought maybe you would have a clue what it was trying to say because it's your game. Sorry for necroing - just wanted to inform you that there have been at least 7 version changes and several improvements to this game, and I'd love to hear your comments on the current version. Tue Oct 28 22:14:30 GMT 2008 ERROR:Sound initialisation failure. Tue Oct 28 22:14:30 GMT 2008 ERROR:Only one OpenAL context may be instantiated at any one time. java.lang.IllegalStateException: Only one OpenAL context may be instantiated at any one time. The JNLP is missing the Solaris natives, so I haven't tested that. Thanks a bunch! I have no idea why it wouldn't listen to keyboard input, sadly. The OpenAL reload issue is known, though - I will make sure to look into that again. The JNLP starts a version which uses LWJGL1.x, but now that LWJGL 2.0 is released (not only as RC), I suppose we should upgrade to that for the webstart version as well.